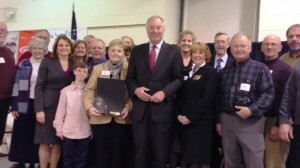 The History of Garrett Mentors Non-Profit Organization | Garrett Mentors, Inc.
Garrett Mentors Inc. Board Members and founding Director, Tricia Cheeseman with Comptroller of Maryland, Peter Franchot, representatives from Garrett County Public Schools and local elected officials for the 2013 Golden Apple Award Ceremony at Route 40 Elementary School in March, 2013. Our organization was founded in August, 2008. Prior to that, former director, Mrs. Tricia Cheesman had retired to Garrett County, Maryland and began volunteering with a children’s organization in the area. Through her work, she and a small group of indivudals began feeling that there could be changes made to better meet the needs of children in this area. She and a group of others sharing her vision formed a board of directors and upon being granted non-profit status, Garrett Mentors, Inc. was officially established in 2008. The program was welcomed and seen as very beneficial for the children in the area in need of a positive adult role model for various reasons. Local individuals began signing up to become mentors serving these children and individuals who had been working with children through the former organization became mentors as well. To meet the financial needs of the children and the organization, Garrett Mentors Inc. began holding an annual Barn Dance fundraiser at Ridgeview Valley in McHenry each September. This event has grown over the years and become a beloved event by locals and visitors alike and has recently begun being held at Sang Hill Farms in McHenry, MD. Backed by a strong board of directors, the school system staff and numerous local supporters, by it’s fifth year in existence, the program was had many solid volunteer mentors, each matched with a Garrett County Public School child in Kindergarten through grade 5. Typically, most mentors serve one child, but a few mentors have chosen to serve two children. In March of 2013 we were honored to receive the Golden Apple Award by Peter Franchot, Comptroller of Maryland for superior volunteer work in the Maryland public schools. Tricia and the Board of Directors accepted the award at a ceremony at Route 40 Elementary. In April of 2013, the organization bid Tricia farewell as she left Maryland for a move south. Our Board of Directors hired Mrs. Laura Fike to fill Tricia’s position as program director in April of 2013. Laura had taught Child and Adolescent Development and Family and Consumer Sciences in Montgomery County, Maryland for five years and had taught second grade for two years prior to that. Laura had just moved to the Garrett County area for a job opportunity her husband, a Garrett County native, had been offered. Her teaching and volunteer background and skills mixed with a warm welcome by the organization and community made for a quick and smooth transition into the role and the program and it’s mission has continued to expand and evolve. Preschool children were added to the organization and the program has gained greater momentum, attracting more volunteers and more community support and awareness. The program is also evolving a vision to allow the children in the program to begin practicing “giving back” to the community as well. In August, 2013, our organization celebrated it’s 5th anniversary and in May, 2014, the Garrett Mentors Joan Johnson Inspiration Award was established by the organization to honor the contributions of former board member Joan Johnson who later pased away in 2014. The purpose of this award is to recognize a mentor or community member who inspires others by their service to Garrett Mentors or the community overall. The first recipient of the award, Suzanne Harle, was presented with the honor in June,, 2014 and a new reciept is chosen each year. September 2014, another big change came to Garrett Mentors when the program was expanded into grade 6 at the middle school, allowing mentors to help with the elementary-to-middle school transition as they continue to meet with their mentee during lunch at middle school. In 2016 the organization established The Garrett Mentors Rear Admiral Richard B. Schiff Memorial Scholarship with The Garrett College Foundation in memory of our past President and friend, Rick Schiff, who passed away in September 2015. The purpose of the scholarship shall be to provide support and benefit for Garrett College students. The scholarship is designed to assist students from Garrett County. Candidates who were enrolled in the Garrett Mentors, Inc. program will be given preference. Secondary preference will be given to military members or current or former military dependents. In 2016 our Annual Barn Dance Fundraiser relocated to Sang Hill Farms in McHenry to accommodate our growing number of guests. In 2018, Garrett Mentors launched a “card for cancer” program encouraging the children and mentors in our program to work together at lunchtime to make uplifting cards for local Cindy’s Fund patients undergoing cancer treatments. In September, 2018, the organization was voted “Garrett County’s favorite non-profit” by our community in the Deep Creek Times People’s Choice Challenge! Garrett Mentors also celebrated its 10th anniversary which was acknowledged and celebrated by the Garrett County Chamber of Commerce and U.S. Senator from Maryland Chris Van Hollen. We look forward to many more years of serving children in Garrett County, Maryland by providing them with caring, committed, adult role models who offer their time each week to make a difference through mentoring.